For other parts forming the Free Area of the Republic of China, see Kinmen, Matsu Islands, Wuqiu Island, Pratas Islands, and Taiping Island. Taiwan (historically known as Formosa, from Portuguese: Ilha Formosa, "Beautiful Island", Portuguese pronunciation: [ˌiʎɐ fuɾˈmɔzɐ]) is an island in East Asia; located some 180 kilometres (112 miles) off the southeastern coast of mainland China across the Taiwan Strait. It has an area of 35,883 km2 (13,855 sq mi) and spans the Tropic of Cancer. 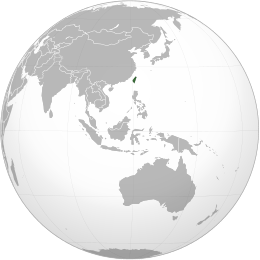 The East China Sea lies to the north, the Philippine Sea to the east, the Luzon Strait directly to the south and the South China Sea to the southwest. 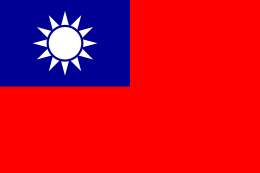 Taiwan proper makes up 99% of the territory of the Free Area controlled by the Republic of China since the ROC lost its mainland China territory in the Chinese Civil War and fled to the island in 1949; this area itself is commonly referred to as simply "Taiwan". The tectonic boundary remains active, and Taiwan experiences 15,000 to 18,000 earthquakes each year, of which 800 to 1,000 are noticed by people. The most catastrophic recent earthquake was the magnitude-7.3 Chi-Chi earthquake, which occurred in the center of Taiwan on 21 September 1999, killing more than 2,400 people. On 4 March 2010 at about 01:20 UTC, a magnitude 6.4 earthquake hit southwestern Taiwan in the mountainous area of Kaohsiung County. Another major earthquake occurred on 6 February 2016, with a magnitude of 6.4. Tainan was damaged the most, with a 17-story apartment building collapsing and a total of 41 dead, 535 injured, and 109 missing. 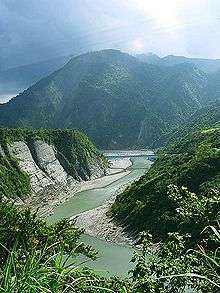 The Yushan Range runs along the southwestern flank of the Central Range. It includes the island's tallest peak, the 3,952 m (12,966 ft) Jade Mountain (Yu Shan), which makes Taiwan the world's fourth-highest island, and is the highest point in the western Pacific region outside of the Kamchatka Peninsula. The island of Taiwan lies across the Tropic of Cancer, and its climate is influenced by the East Asian Monsoon. Northern and central Taiwan has a humid subtropical climate, with substantial seasonal variation of temperatures, while most of southern and south eastern Taiwan has a tropical monsoon climate where seasonal temperature variations are less noticeable with temperatures typically varying from warm to hot. During the winter (November to March), the northeast experiences steady rain, while the central and southern parts of the island are mostly sunny. The summer monsoon (from May to October) accounts for 90% of the annual precipitation in the south, but only 60% in the north. The average rainfall is approximately 2,600 mm per year. ↑ "Taiwan". The World Factbook. CIA. 18 April 2012. Retrieved 6 May 2012. 1 2 3 4 "1.1 Number of Villages, Neighborhoods, Households and Resident Population" (XLS). Monthly Bulletin of Interior Statistics. Ministry of the Interior, Republic of China (Taiwan). November 2012. ↑ Chang, K.C. (1989). translated by W. Tsao, ed. by B. Gordon. "The Neolithic Taiwan Strait" (PDF). Kaogu. 6: 541–550, 569. ↑ National Taiwan Normal University, Geography Department. "Geography of Taiwan: A Summary". Retrieved 21 May 2007. ↑ "The Geology of Taiwan". Department of Geology, National Taiwan Normal University. ↑ "GSHAP Region 8: Eastern Asia". Global Seismic Hazard Assessment Program. ↑ Tsukada, Matsuo (1966). 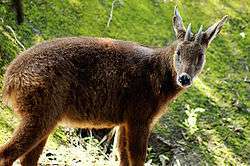 "Late Pleistocene vegetation and climate of Taiwan (Formosa)". Proceedings of the National Academy of Sciences of the United States of America. 55 (3): 543–548. doi:10.1073/pnas.55.3.543. PMC 224184 . PMID 16591341. ↑ "Taiwan's Energy Policy and Supply-Demand Situation". Bureau of Energy, Ministry of Economic Affairs. ↑ "Taiwan: metropolitan areas". World Gazetteer. Retrieved 19 December 2012.